There are 4 reviews of Paisley . After a minute of freshness, a creamy ylang ylang and vanilla combo take the lead. There is a green element in the background that stays for a good while and makes the fragrance unisex, in my opinion. A nice jasmine is completing the flower bouquet and I think it has become rather sensual. The dry down is a vanilla leading creamy and flowery perfume and this part leans more feminine. Paisley is a shy oriental. "I'm a very private person," you think when you sniff it. But not shrinking or incurious, just radically self-contained. The first spray admits a shower of cheerful bergamot and pink pepper, the combo provoking a double-take. That opening soon scatters. The rest of the hours are smoothed away by the expert hands of a gorgeous ylang-ylang. The cardamom spices it up but also makes the indulgence feels a little cold and distant, bracingly. Paisley's final wafts aren't perhaps as potent or resinous as a proper Oriental, but they remain fascinating. It's as if a breathtakingly attractive stranger approached you and had a drawn-out heart-to-heart for some short hours before abruptly, unceremoniously departing from your life forever. Add the pang of sudden leave-taking to the overflowing heart-on-the-sleeve sincerity and you have Paisley's compelling mystery. It's pretty enough to be devastating but discreet to the point of invisibility. Little throw, ghostly tenacity. Dead lovely, here now, then hereafter all too soon. A good scent -- not sweet, heavy. Not like everything else on the market. Distinctive. Opening is crisp, business-like yet with a hint of spice. Mild green notes are evident. The grey ambergris is synthetic but effective -- a cool ending to an interesting scent and works well with the spices. Aimed a a women's market but a guy could wear it. Not bottle-worthy for me but it is OK. I have bought Paisley for my girlfriend, who's been wearing it pretty much non-stop for the last month (and that's with immortal classics like Loulou by Cacharel and Shalimar in her wardrobe). As far as notes are concerned, I think the advertised pyramid is pretty much spot-on - what's not necessarily clear by reading it, though, is the amazing aptness of the name: this *is* olfactory paisley. Every single time my GF sprayed it, I got a different vibe (after a while, I stopped asking her "is it Paisley?" because I just felt dumb): it smells just like the fabric pattern, with several different colors very close to each other, always intersecting and bisecting without ever quite mixing down to a dull gray-brown. The end result is utterly fascinating and absolutely enticing - I wouldn't call it a classic just yet, but it's certainly one of the most interesting feminine (or possibly unisex, for the more adventurous) scents in the designer segment. 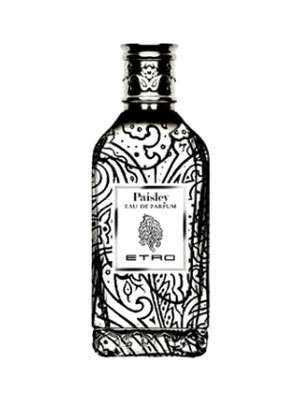 Etro Paisley 10ml Guaranteed Authentic New in Box Unsprayed Fast Shipping! There are no member images of Paisley yet. Why not be the first?